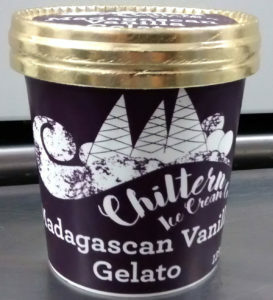 Artisan creators of exceptional ice cream, gelatos and sorbets based in Chilterns. Artisan really means something to us, its about locality and individuality with uniquely handcrafted flavours made with the finest real ingredients. Local is much more than a # or soundbite to us, it means genuinely using ingredients from producers on our doorstep or making them ourselves. We really understand individuality, some of our creations are so bespoke we might only ever make a single 5 litre batch! We love to collaborate, it makes for some fantastically bespoke truly unique creations. Our 125ml tubs have spoons in their attractive gold rim lids. Our 500ml tubs are the perfect size for your customers to pickup our fantastic flavours for sharing at home. This size is currently packaged for supply to restaurants and parlours. We can supply any flavour in this size. For now we don’t have one, we’d prefer you remained stocked rather than run down/out of flavours waiting to have a large enough order. Lets face it, half empty cabinents or empty baskets or shelves aren’t that attractive to customers. No one wants to feel like they’re picking over the scraps of whats left! Provided you’re not ordering a single 125ml pot at a time we’ll try to work with you! Whats the minimum size for a bespoke flavour? 5 litres, but that can be be in any size container (125ml, 500ml, 2.5l, 4l) and even across container sizes! That does very much depend on what the flavour is. If its a variation on one we already do then it could be the same week or even the next day depending on where we are in a production cycle. If we need to source ingredients it could take a bit longer, but generally no more than a fortnight. How long between placing an order and it being delivered? We’ve been known to deliver the same day! It does depend on what you’re ordering and whether its in stock, typically its no more than a couple of days. Can you arrange for a freezer? 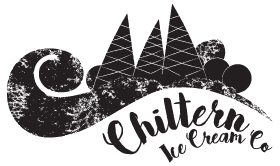 We don’t, but if you already have a freezer and you’d like us to apply the Chiltern Ice Cream Company logo get in touch and we’ll see what we can do.